R.J. Tilley provides plumbing and remodeling in the Manakin-Sabot, VA area. For 40 years, R.J. Tilley has served the needs of central Virginia homeowners with professional plumbing services. Over this time, our services have broadened beyond plumbing to include bathroom and kitchen remodeling. Our highly-trained staff includes both experienced plumbers and carpenters, so you can count on us to handle just about any job. From gas lines for outdoor grills to gas inserts for your wood burning fireplace, our gas fitters are licensed and insured to handle all gas conversions. R.J. Tilley is familiar with nearly every water heater on the market. We’ll take care of assisting you with selecting the right option for your hot water needs and budget, as well as install the new unit for you. Whether you want an electric, gas, hybrid or tankless water heater, our knowledgeable plumbers and staff will help you make the most cost-effective, practical choice for your home. For bathroom and kitchen remodeling, R.J. Tilley is your general contractor, so from floor to ceiling, we’ll handle all the details! Ready to remodel your bathroom or kitchen? Check out our showroom for design inspiration, ideas and to get expert advice from design professionals. We know all too well that your home depends on efficient systems to provide you the comfort and safety you expect and deserve. From emergency repairs to installation and maintenance, we can fix that! 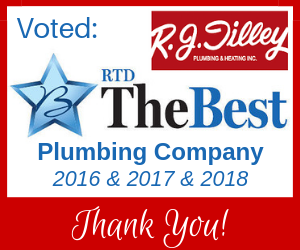 Over the years, local residents have helped us build a reputation as one of the best plumbers in Richmond, VA. Read some of our online reviews to hear what our customers are saying! Contact R.J. Tilley today—we look forward to serving all your plumbing and remodeling needs!